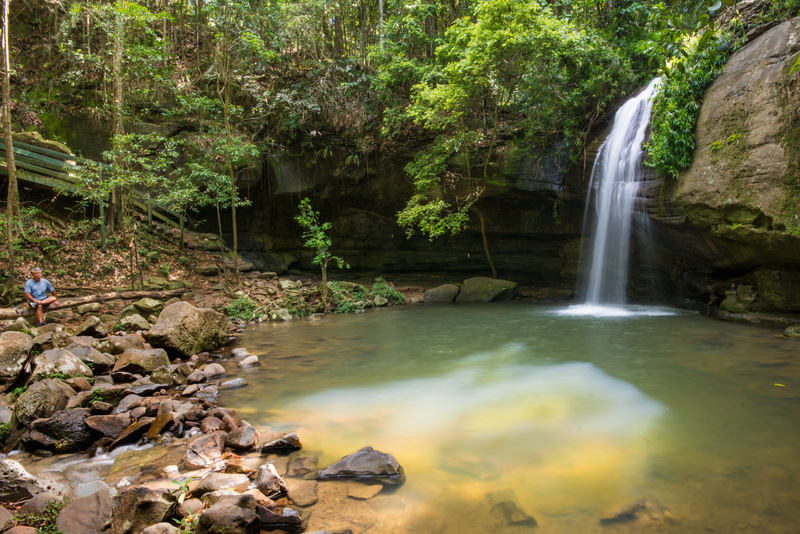 Serenity Falls is in the Buderim Forest Park, inland of the Sunshine Coast, north of Brisbane, Australia. It is a stream-fed falls and is very easy to get to from either end of the park. It is a popular swimming spot, so get there early if you want to avoid crowds. The creek flows roughly west-to-east, so in the morning, the sun is behind the falls. For this shot I arrived about 8AM in mid-summer and the sun was already high. The surrounding forest is pretty dense so at either end of the day the falls will be in the shade. By the time I left (about 9AM) people were arriving and the sun was reaching the top pool. The light was getting too contrasty for me by then.